Here’s my Tigress Can Jam creation courtesy of the lovely Kaela’s pick for October: Chiles! 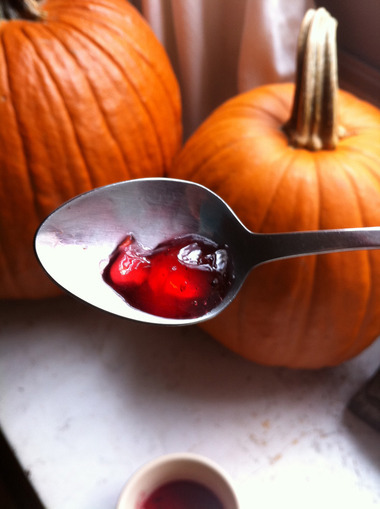 Meet cranberry jalapeno/habanero jelly!This cranberry jala-banaro jelly is a real looker. I posted a week early because I failed to read the directions properly, so this is a re-post after a very brief airing on Friday. I waited till the last minute to post because I wanted to see if it was going to set. Verdict: Yes! Here’s how I made her (this jelly is decidedly a ‘she’). I arrived at the name after a few days of deliberating. It’s a flavor combo that explodes, causes a bit of damage, and then resolves itself in short order, not unlike an episode of Murder, She Wrote. All this is to say, I wouldn’t omit the vinegar if you want to waterbath can it. Make it to keep solely in the fridge and do as you please. Don’t forget to revisit my jelly post for tips on jellymaking sans commercial pectin. This is a two-day deal, or a morning and evening kind of thing. 2. 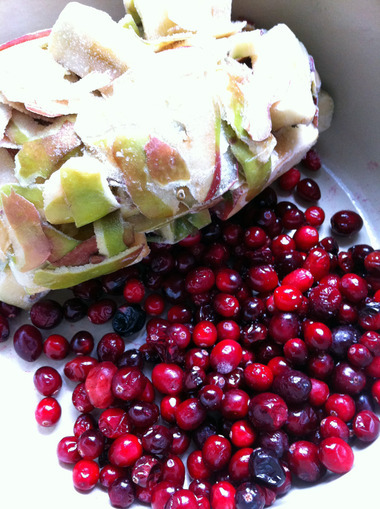 Remove pot from heat when fruit is tender and mash berries with a potato masher. I just went around the apple debris, but it’s not the end of the world if you mash the apple cores. Place pot back over medium-low heat and simmer for 5 more minutes. 3. Strain mixture through a few layers of cheesecloth, a muslin produce/grain bag, a real jellybag, or whatever, for at least 6-hours. Here’s my improvised jelly bag set-up. If you’re leaving it overnight, just set it in the fridge and let it drip in there. 5. After that’s been dehydrating for at least an hour (that’s what the salt does), rinse the peppers really well under cold water. And then rinse them again. 2.5 cups organic raw sugar and stir the juice with the sugar over low heat to dissolve the crystals. minced and rinsed peppers Boil the mixture until all areas in the pot reach 220 F (and pass the spoon test). Tips on this process are detailed in the jelly post link above. The ultimate who-done-it: Lady Jelly strikes again…8. Put hot jelly in hot jars, wipe rims really well and seal with two-piece lids. Process in boiling waterbath for 10 minutes.